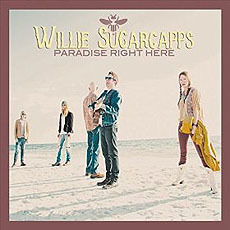 For those not in the know, Willie Sugarcapps is the Gulf Coast’s new collaboration between Will Kimbrough, Anthony Crawford, Grayson Capps, Corky Hughes, and Savana Lee. Whether you know it or not, you’ve already heard of them and are already familiar and comfortable with their work. Individually they have written, played, sung, and toured their way from Nashville to New Orleans, from Georgia to Hollywood, with the likes of Jimmy Buffett, Emmylou Harris, Neil Young, Kate Campbell, Dwight Yoakam, Steve Winwood, and Kung Fu Mama just to name a few. Their brand new album, Paradise Right Here, was produced, engineered, and mixed by Grammy Award winner Trina Shoemaker (Sheryl Crow, Dixie Chicks, Emmylou Harris) and is out April 2016 via Baldwin County Public Records. Combining the vocal aspects of each band member taking turns leading the songs together with their overall, and highly gifted versatility switching things up between fiddle, banjo, mandolin, lap steel, bass, and even ukulele, Willie Sugarcapps is a band never set in their ways - and nor is their addictive, and fresh-sounding music.